The system is based on the price capability to move in a particular direction during day and highly volatile periods. The backtest has been conducted from 2009. Timeframe – M15. Currency pairs: EUR/USD, GBP/USD, USD/CAD, NZD/USD. The EA can be backtested by bars or every tick. SpreadFilterPip - spread filter in pips. If spread is more than this value, then signal will be ignored. 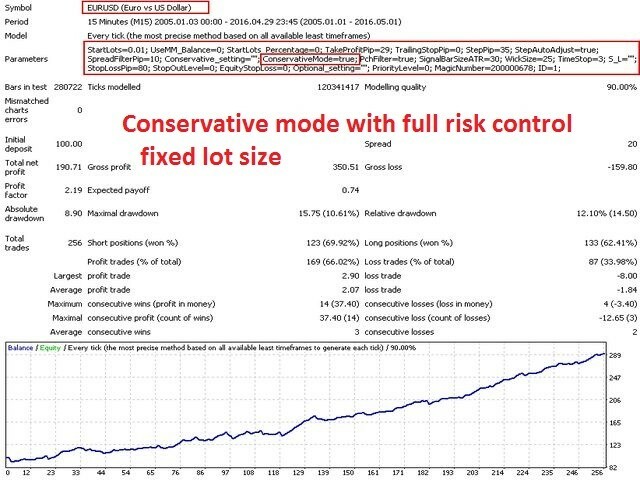 ConservativeMode - if true, the EA will not use averaging and martingale\grid elements. The DiggerEA will trade only favorable situations and will control risk by using stop loss (StopLossPip) and time stop (TimeStop). 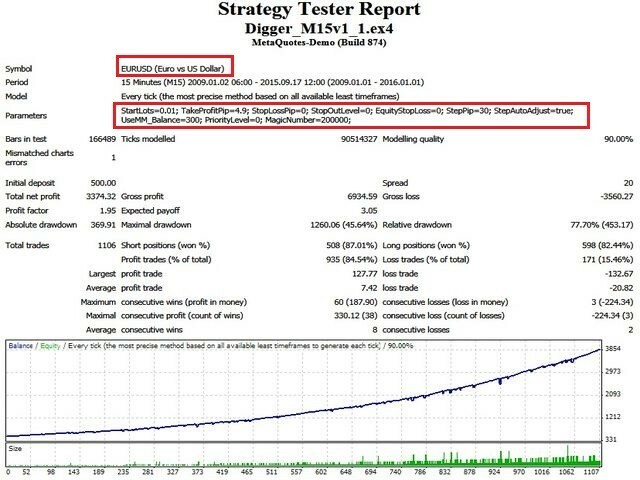 PchFilter - if true, the DiggerEA will use a filter based on location of prices in the intraday trading range. For ConservativeMode=true only. SignalBarSize%ATR - the body size of the signal bar. For ConservativeMode=true only. WickSize% - the shadow size (upper\lower for buy\sell) of the signal bar. For ConservativeMode=true only. TimeStop - certain numbers of bars after which the position will be closed if trade does not reach take profit or stop loss. StopLossPip - stop loss in pips from the entry price. The StopLossPip is must have for ConservativeMode=true. StopOutLevel% - account margin level in %, at which the EA will close all trading positions. EquityStopLoss% - percentage from the initial equity. If the current equity drops below EquityStopLoss%, the EA will close all trades. PriorityLevel=0...10. If multiple advisors got the signals to open a new position simultaneously, the position will be opened by the EA with a higher PriorityLevel (0 - the highest priority). MagicNumber - unique number of the EA's orders. To trade multiple instruments, you must open separate charts for required currency pairs and attach the EA on each of them. In this case, the MagicNumbers of all DiggerEA must be same. To reduce the risk, only one EA can open trade at a time. For example, if one DiggerEA gets the opening signal while the other DiggerEA has already opened position, the signal will be ignored and the new position will not be opened. ID - unique identifier for the EA. Used for the better control of orders when running several of my EAs (such as Digger, Miracle) with same MagicNumber. Мартин = слив депо!!!!! Поиграться на демо или центовике,и не более того! It's a grid EA, so it has a big risk and a small return. But, if you are not greedy, it will work for you properly. Good EA but it's Martingale. Aleksey, today your Digger took 4 positive shots in less than 1h, GBPUSD M15, you did a great job indeed! ;-) thanks so much. Very Good EA. Showing good results on demo and real accounts. It's crazy that this EA is for free. Like others had already said: the author could have just as well sold it for a couple of Dollars, so giving it away for free is very generous. Best free EA, thanks for share! I downloaded this EA with the purpose to grow my account up slowly and consistently. I use the conservative set file. You won't double your account in few months, but this is an EA that i like very much, because with the conservative mode, you always know how much you will lose in the case of the price hit the SL, so it is stress free. Just put it on a VPS and forget about it, it will do his job nicely. Based on my backtest (99% accuracy) it shows to be profitable on long run (to double the account in one year is possible with relative small DD). Plus this is a free EA! 5 star!!! 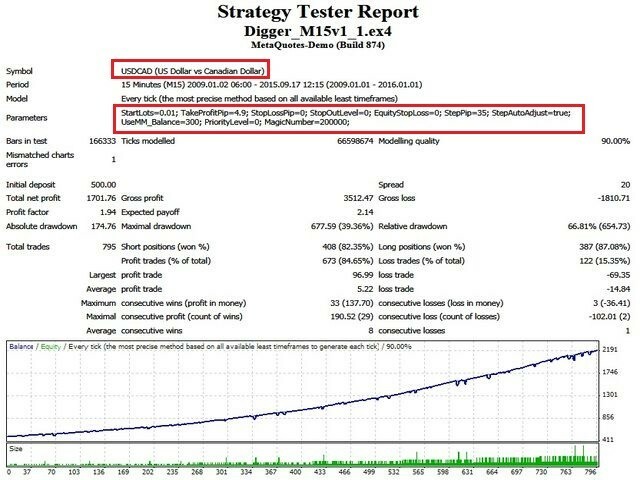 Set coppied form developer signal - EURUSD_m15, USDCAD_m15, NZDUSD_m15. It's running on my acounts about 3 months, it's very good and profitable EA! Три месяца тестирования показали рост депозита. 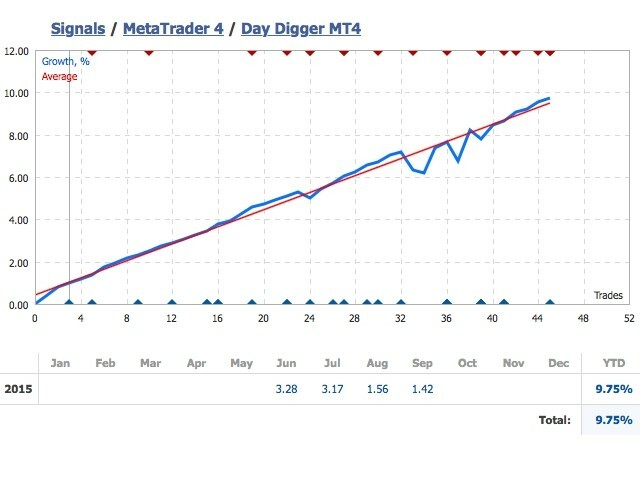 For 2 months I let it trade M15 EURUSD with 208 USD with result of ending capital on 224,18 USD. only 1 martingale situation. Nothing horrible. Next months and years will show. But for now recomandable. A big plus, it is free and succesfull. A dream combination. It is clearly for common people. Thank you for this EA Aleksej!!! Really good, just be sure to mix with come kind of hedging strategy, or when you equity is at a profitable amount, close all trades and allow the EA to start over. So far so good on recommended pairs. How sett for real money ?? Give reason please. Well, this is one fine piece of work. Very stable and consistent profit. Thank you for the free product. заслуживает доверия. В обсуждении скрин с мониторинга. Thank you for offering it for free. I experienced it with Python on demo account for a few weeks last year. No doubt to me that Digger is better than Python, which has not given any profit at all. Backtests and signals are confirming this. I admire Aleksey. Good EA if you know how to use it. Simply it works. Great job. why this EA can't work? Could you tell how to set the parameter? is there anything condition? Thank you very much! Consistency is the key to successful trading. This EA has consistent profitability, but as always keep risk in mind! - Introduced ConservativeMode. If 'true', the EA will not use averaging and martingale\grid elements. 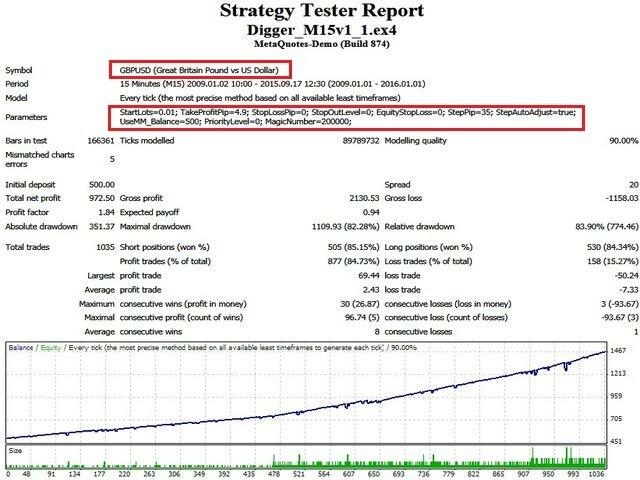 The Digger will trade only favorable situations and will control risk by using stop loss(StopLossPip) and TimeStop. - Introduced a new parameter - SignalBarSize%ATR. For ConservativeMode=true only. SignalBarSize%ATR - body size of the signal bar. - Introduced a new parameter - WickSize%. For ConservativeMode=true only. WickSize% - shadow size (upper\lower for buy\sell) of the signal bar. - Introduced a new parameter - TimeStop. For ConservativeMode=true only. TimeStop - number of bars, after which the position will be forcefully closed if trade does not complete in TakeProfit or StopLoss. - Introduced a new parameter - PchFilter. For ConservativeMode=true only. 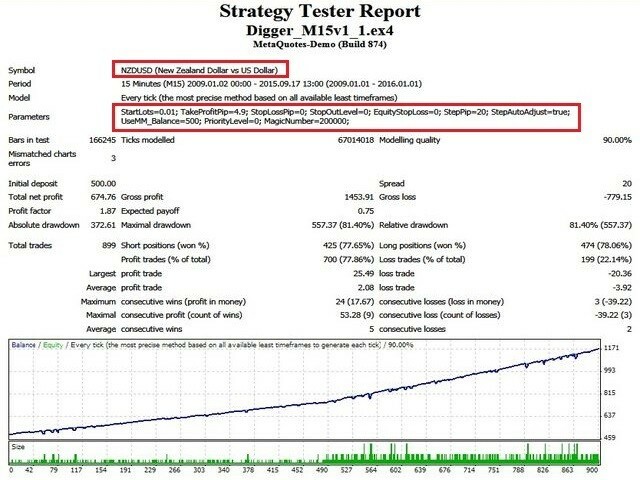 If 'true', Digger will use a filter based on location of prices in the intraday trading range. - Introduced a new parameter - 'StartLots%Depo'. Initial lot value in %. When not zero the initial lot is calculated as % of the deposit, StartLots and UseMM_Balance parameters are ignored. If zero then EA will work with StartLots and UseMM_Balance. - Introduced a new parameter - 'SpreadFilterPip'. The spread filter in pips. 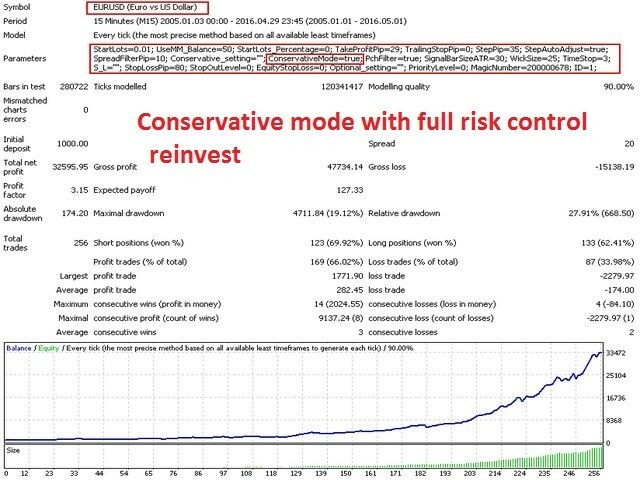 If spread is greater than this value then signal will be ignored. - Introduced a new parameter - 'ID'. Unique identifier for the EA. Used for better control of orders when running several of my EAs (such as Digger, Miracle) with same MagicNumber. 1. Implemented auto-adjustment of the step of the averaging. Introduced a new parameter - StepAutoAdjust. If StepAutoAdjust=true, then the step value will auto-adjusted by the EA based on the Intraday and daily volatility. 2. Multicurrency support. To trade multiple instruments, you must open separate charts for required currency pairs and attach the EA on each of them. In this case, the MagicNumbers of all DiggerEA must match. To reduce the risk, only one EA can open trade at a time. For example, if one DiggerEA gets the opening signal while the other DiggerEA has already opened position, the signal will be ignored and the new position will not be opened. Introduced a new parameter - PriorityLevel=0...10. If multiple advisors got the signals to open a new position simultaneously, the position will be opened by the EA with a higher PriorityLevel (0 - the highest priority). 3. Improved trading setups\filters of the EA. Now, the EA finds more entry points and more trades. 4. Improved the mechanism for adjusting the starting lot based on the market situation. 5. Added some technical stop losses. When stop-loss triggered, all orders are closed by the EA. If set to 0, the stop loss is disabled. StopLossPip - stop loss in pips from the entry price.